Andy Serkis again puts on the motion-capture suit to play Caesar, the leader of a colony of superintelligent apes, with Toby Kebbell as Koba and Karin Konoval as Maurice the Orangutan in “Dawn of the Planet of the Apes.” Jason Clarke, as Malcolm, tries to bridge the evolutionary gap with Caesar to bring peace to humans and apes. 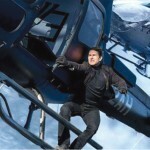 image courtesy Warner Bros. Reviewing a stand-alone movie is easy. Reviewing a movie’s sequel or prequel is also pretty straightforward. Reviewing a movie that is the eighth in its franchise and the third in the story’s chronology? Not so easy. Especially when yet another pre/sequel is being made that may or may not plug up the plot holes in this installment. Eight or 10 years after the ending of “Rise of the Planet of the Apes” (depending on who you ask), the Simian Flu has wiped out a big ol’ chunk of the human race, and those that happened to be genetically immune are holed up in little post-apocalyptic colonies. The apes are doing much better. With Caesar (Andy Serkis) as their leader, they’ve built up a cool treehouse city, where they hold school for the younguns and launch hunting parties. Neither the humans or the apes know the other is still alive until one startled survivor shoots an ape after they bumped into each other in the woods. 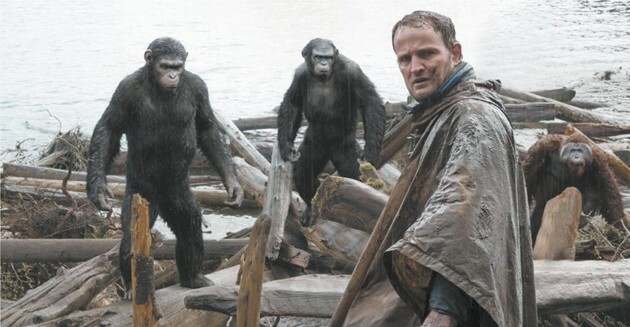 The injury brings the apes and the humans to the brink of war, but one human, Malcolm (Jason Clarke), tries to build rapport with Caesar — especially since the dam, their only chance for hydroelectric power, is squarely in ape territory. With Caesar’s wary blessing, Malcolm and five other humans, including Ellie (Keri Russell) and his son, Alexander (Kodi Smit-McPhee), try to restore the dam. One ape, though, Koba (Toby Kebbell), disagrees with Caesar’s diplomatic ways, and tries to find evidence the humans are a threat. And in the human camp, the leader, Dreyfus (Gary Oldman), is running out of patience with Malcolm’s peaceful plan. Has anyone told Andy Serkis how awesome he is lately? His motion-capture character is flawless, and props to the CGI department for incredible animation. Some of the apes are so lifelike you swear you’re seeing real ones. Although the story is and feels long, there are some interesting elements to the plot. The comparison between how the humans and the apes fare is handled well, especially when both societies are on the brink of collapse. We may be different species, but if there’s one thing “Dawn of the Planet of the Apes” teaches us, it’s one bad apple can take down an entire human civilization — or an ape civilization that is heavily based on human civilization. We’re really not that different after all. But it takes more than two hours to tell us this, so make sure you watch the total degradation of human and simian society after you go to the bathroom. There are few things worse than trying to sit through post-apocalyptic politics with a full bladder. 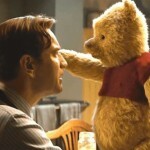 And also, this is movie No. 8 in the franchise. Did you all hear that, all the way in the back? Eight. Eight movies. If you wait for two years, there will be nine, because they’re making another prequel as we speak. To me, that feels a tad excessive. I mean, not even the “Fast and the Furious” has nine installments (yet). That’s even more than Peter Jackson got for “The Hobbit,” or J.K. Rowling is getting for “Fantastic Beasts and Where to Find Them.” Is there really nine movies worth of story? I don’t know. I just don’t know. Because of this, it’s difficult to tell how the continuity is. There were plenty of plot holes, but there’s at least one more movie to fill them all up and knit the whole thing together. Will Movie No. 9 do it? Probably not, but who knows? If it can’t get it done, maybe they’ll round it out with a 10th movie. You know. Why not?